Places filled with great history! using grape varieties of the region. The winemakers will be more then happy to show you their cellar and share their know-how. the typical taste of the Aveyron. the market where you will meet the producers and taste their unique products and authentic taste. Many craftsmanships that still exist in our region. A must see !! with its colours, flavours, aromas etc. … Tourists and locals rub shoulders in a festive atmosphere of the southern markets. 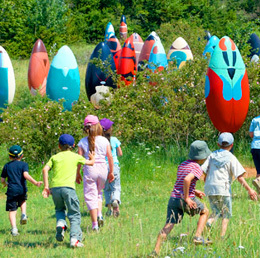 (near the viaduct of Millau): Do you remember Microcosmos? The movie which revealed the wonderful world of insects! A few km from the movie set, this is a fun and educational leisure park for the whole family, where you will discover the insects and their natural environment.